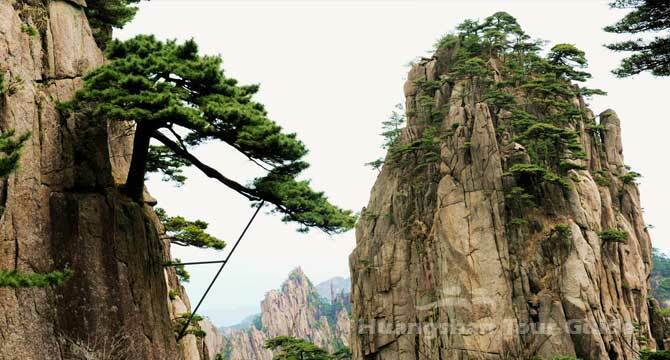 See the Yellow Mountain’s unique pines, peaks, rocks, sunrise, sea of clouds, and learn about the history & culture of the Chinese Porcelain. Day1 Meet your guide and transfer to the hotel. Day3 Explore the Yellow Mountain and Hongcun Village. Day4 Visit Hongcun Village. Drive to Jingdezhen Village. Day5 Visit Jingdezhen Ceramic Historical Exhibition Area, Jingdezhen China Ceramics Museum, and Yaolin Ancient Town. Drive to Jingdezhen airport. Independent arrival at Huangshan airport or train station, where you are met and chauffeured to your hotel in Huangshan city downtown. Today, drive to Tangkou Town, where we will change the tourist bus to Yungu Temple. Take the cable car up to the Yellow Mountain, visit the Beginning-to -believe Peak, Writing Brush Peak, Cooling Terrace, Monkey Gazing at the Sea, Lion Peak and so on. Go on the walking trip from the Cloud Dispelling Pavilion to the bottom of the West Sea Grand Canyon. Then walk along the West Sea plank road to the beautiful Heavenly Sea Scenic Area (aka White Cloud Scenic Area) via the Fairy Walking Bridge. Note: The whole walking trip will take about 5-6 hours, if you feel tired at the the bottom of the West Sea Grand Canyon, you can choose to take the cable car (at your own expense) up to the Heavenly Sea Scenic Area. After breakfast in the hotel, explore the Heavenly Sea Scenic Area (White Cloud Scenic Area), we will pass through some famous sights, such as the Narrow Cliff, Turtle Peak, Heavenly Capital Peak (Celestial Capital Peak), Lotus Flower Peak, Welcome Pine, and so on. Take the Jade Screen cable car down the mountain and then take the tourist bus to Tangkou. Continue our journey to Hongcun Village, a UNESCO World heritage site housing typical South Anhui style architecture. The Oscar-awarded movie Crouching Tiger, Hidden Dragon was filmed there. After breakfast, explore Hongcun Village's buildings, old lanes and experience the local people's life. After lunch, drive to Jingdezhen, the "Porcelain Capital". This morning, pay a visit to the Jingdezhen Ceramic Historical Exhibition Area and Jingdezhen China Ceramics Museum. After lunch, drive about 1.5 hours to Yaoli, an ancient town has beautiful natural scene and age-old ceramic civilization. It is world-famous for its porcelain clay - kaolinite clay. The town is also known as the source of Jingdezhen. In the late afternoon, transfer to Jingdezhen airport for the flight to your next destination. All entrance fees to scenic spots as listed above in the itinerary. The final arrangement will be determined by local tour guides based on the local circumstances which are beyond the control of TourJiuZhaiGou. TourJiuZhaigou will adhere to the original itinerary as accurately as possible. Any extra cost caused by changes of natural disasters, fires, weather, governmental and local authority orders, political change, strikes, war, riots, quarantine, custom regulations, damages or injury caused by accident beyond the control of TourJiuZhaiGou and that has incurred due to the tourist action violating the laws.